Venezuelans will go to the polls in all-important legislative elections on Sunday December 6, 2015. 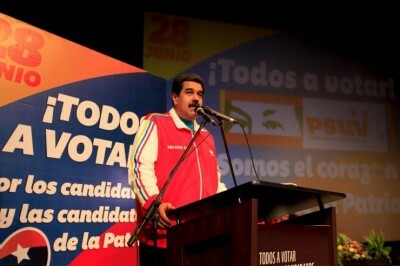 The vote will have a significant impact on the course of the Bolivarian Revolution started by the late Hugo Chavez. A victory for the opposition could be problematic for the government of Venezuelan President Nicolas Maduro as an opposition-led National Assembly would use all tools at its disposal to hamper any efforts at continuing the process of political, economic, and social transformation still ongoing today. Walking the streets of Caracas, Venezuela’s capital, one gets the sense that the people are largely still supportive of the government, despite their understandable grievances about runaway inflation, lack of basic goods, and increasing violent crime. However, one gets a very different picture from US and western media with its droning propaganda about ‘dictatorship’ and ‘unfair elections’. Were one to read solely the corporate media, one could be forgiven for thinking that the government is on the verge of collapse, and that the opposition is either poised to control the government, or to have the election stolen from them. In fact, the opposition has already laid the groundwork for a potential destabilization of the country as a number of key figures have openly stated that should they lose the election, it would be an indication of fraud. Essentially, the opposition Democratic Unity Roundtable (MUD), which is neither democratic nor unified, has manufactured a win-win scenario wherein a loss in the election proves it was cheated, thereby allowing it to decry the elections as a fraud: a pernicious lie which only would benefit them. Such tactics are par for the course for an opposition made up of US-backed, right wing neoliberal members of the former ruling class – an opposition that heralds criminals such as Leopoldo Lopez as righteous heroes persecuted by the government. The violence that is likely to break out should the MUD lose is also a standard tactic of everyone from criminal gangs to fascist political formations, both terms aptly describing the Venezuelan opposition. This narrative of ‘election fraud’ is the same one trotted out by the opposition in every election in the last 15 years, with US media dutifully providing the cover of legitimacy to baseless claims as it repeats the same tired, utterly discredited talking points about ‘dirty elections’. The truth however is that Venezuela’s electoral system is the best, “most transparent in the world,” as former US President and humanitarian Jimmy Carter proclaimed in 2012. Indeed, despite the lies and distortions of the US media, these elections will be free, fair, and reflective of the will of the people. Oops. Unfortunately for the Washington Post and the opposition, one of their principal claims – that the CNE deliberately placed the MUD next to another party with the word Unidad (Unity) in the name – has been thoroughly exposed. The fact that the placement of the parties on the ballot was agreed to by ALL parties in a public forum, even after all had been given a chance to voice their objections, proves that the MUD in fact signed off on the physical make-up of the ballot. But why? The logical explanation is that the opposition wanted this setup in order to use it as yet another justification for their discredited narrative that the CNE and the government are attempting to confuse voters. In fact, the opposite is true. It seems that it is the opposition that is desperate to create confusion, fabricating a pretext to invalidate the results of the election and bring down the wrath of the US political class. So while MUD perpetually accuses the Venezuelan government of dirty tricks, it is in fact the opposition engaging in underhanded tactics. One must also recall that what the right wing opposition means when they refer to the “gerrymandering” of districts and the “unfair” tactics of the government is that they resent having poor people housed in public housing projects located in what were once exclusively well-to-do neighborhoods. When they argue that the government is simply doing this to increase its votes in certain districts, they do so with all the attendant racism, classism, and reactionary language that one should expect from a comprador former ruling class. Anyone who has ever actually studied the Venezuelan electoral process knows perfectly that the multiple redundancies and transparency requirements make it impossible to tamper with the election results. Those who oversee each counting table at each voting station are randomly selected. The machines require fingerprint activation, identification, signatures, and other forms of authentication. All voting receipts and records are automatically audited at no less than 53%. All financial records for all candidates and parties are presented for verification. There are a number of other mechanisms of transparency that bolster Jimmy Carter’s assertion that Venezuela’s electoral process is the most transparent in the world. Finally, there is the issue of poll numbers and how the corporate media has used them to convince the world that anything other than a resounding victory for the right wing means the election was stolen. Nearly every media outlet has referenced the notion that the opposition leads by 20-30 points, however they fail to mention the fact that many of the polls cited are from anti-government sources, including opposition and US-funded NGOs. However, perhaps the most respected independent pollster in Venezuela, Oscar Schemel of HINTERLACES, who has a sparkling track record of independence and accuracy, has predicted that ” that the trends indicate the possibility that forces of the Great Patriotic Pole who defend the Bolivarian process may obtain 43 percent of the votes and with that, 96 of the 167 seats of the National Assembly (parliament).” The importance of this point is that his analysis takes into account the seats up for grabs, the districts being challenged, and the various competing political groupings. It’s critical to remember that only the Chavista bloc is united, the opposition is completely divided, with unity being merely a word in their name, rather than a characteristic of their political formation. Washington’s Democratic Heroes or Plain Old Criminals? There is also the equally spurious claim from the Washington Post, as well as the US Government itself, that the Venezuelan Government has unfairly banned leading opposition figures from standing for election. In particular though, it is Leopoldo Lopez and Maria Conchita that are especially highlighted. However, the US media conveniently leaves out the fact that both have been implicated in a number of criminal activities, including criminal conspiracies to bring down the government on more than one occasion. Of course Lopez is also widely remembered for inciting violence during the coup of 2002 by authorizing the rerouting of an anti-Chavez demonstration to the presidential palace knowing that it would run head-on into a pro-Chavez rally. As Foreign Policy noted, even the coup leader Pedro Carmona has admitted in his autobiography that he “’consulted with’ Lopez and that the protest’s fatal route change was ‘authorized by Mayor Leopoldo Lopez.’” Lopez has also been implicated in multiple assassination and coup attempts against the Maduro government. Yes, the man the US hails as a heroic democrat and political prisoner is, in fact, a violent thug and corrupt criminal with obviously fascist tendencies as evidenced by his calls for the beatings and killings of political opponents. Another principal figure that the US media endlessly upholds as an opposition leader oppressed by the government is Maria Conchita, a Cuban-Venezuelan singer turned politician. Of course, the media and Washington fail to mention that Conchita was connected to a major assassination attempt against Chavez. It was revealed that at least 150 paramilitary assassins were housed on a farm belonging to Conchita’s brother and associate Robert Alonso, placing Conchita right in the center of a major conspiracy to overthrow the government and reassert right wing control of the country. Sound familiar? And these are the glorious heroes of democracy that the US upholds, that Washington utilizes as weapons with which to demonize the Bolivarian government? There is also the lie that the government has unfairly barred Maria Machado’s Vente Venezuela party from participating in elections. However, as Ms. D’Amelio clearly explained, “Maria Machado has claimed that CNE has refused to allow her or her party from being included on the ballot. The fact is that she and her party are not registered because they did not meet the deadline which is set way in advance of the elections.” Again, this is an example of an opposition member concealing their own incompetence (or worse) by simply blaming the CNE. Yet another blatant attempt at discrediting the CNE and the electoral process through demonization. She’s continued doing so on twitter, writing recently that she will not recognize the results of the election. It should be noted that the Washington Post is not alone in its crusade against Venezuela’s electoral system. There are literally hundreds of other articles and white papers disseminating misinformation about the Bolivarian Republic. The Brookings Institution, well known to be a major right wing outlet for US government policy recommendations, recently wrote a paper entitled Venezuelan elections: Could Chavismo lose?, a piece that is essentially a laundry list of still more blatant fabrications and distortions designed to give the false impression of Venezuela as some backward dictatorship rather than a progressive socialist country that respects democracy more than almost any other state in the world, one which demands to have its sovereignty respected, one which values its independence and freedom in a way that is almost difficult for the US to grasp. This is one of the lasting legacies of Hugo Chavez: independence. Venezuela is an independent country with an independent foreign policy. It is a beacon of socialism and anti-imperialism for the world, a pole of resistance against the Empire and neoliberal capitalism. It is a country that stands on its feet, rather than prostrating itself before the US. And this is why Venezuela is demonized, why the US must always seek to undermine Venezuela’s democracy, to destabilize it and, ultimately, to bring it to heel. But Venezuela will never kneel before Washington again. Its democracy is rooted in justice and equality. Its guiding principles are those laid out by Comandante Chavez: unity, struggle, battle, and victory. And, despite US aspirations and desires, Venezuela takes these principles seriously. And that is why it must be defended at all costs.